The Scimitar syndrome is a spectrum of cardiovascular and bronchopulmonary abnormalities. Its classical form is represented by partial or total anomalous pulmonary venous drainage of the right lung to the inferior vena cava, varying degrees of right lung and right pulmonary artery hypoplasia that results in dextroversion of the heart, and an anomalous systemic blood supply from the abdominal aorta to the inferior segments of the right lung. Anomalies of the right bronchial tree are invariable features. We describe two cases of an uncommon variant of Scimitar syndrome diagnosed in two siblings. There was no familial history of congenital heart disease, extra-cardiac malformations, and parents were not consanguineous. This female had an antenatal diagnosis of Scimitar syndrome at 24 weeks of gestational age. She was born at full term and had an uncomplicated postnatal course. She was asymptomatic at first cardiac assessment at few weeks of age but echocardiogram showed an unexplained mild left ventricular enlargement and dysfunction (fractional shortening 25%). At 6 months the patient underwent cardiac catheterization and bronchoscopy under general anesthesia and this revealed a Scimitar variant consisting of: Severe stenosis of the right pulmonary vein at its connection with the inferior vena cava, atrio-ventricular and ventriculo-arterial concordance, no interatrial communication, with a fistulous communication of the anomalous vein to the right upper pulmonary vein which drained normally to the left atrium [Figure 1]. There was absent right pulmonary artery and right lung hypoplasia, one large aorto-pulmonary collateral arising from the coeliac axis to right middle and lower lobes, dextroposition of the heart and an anomalous left circumflex coronary artery arising from the proximal left pulmonary artery. The pulmonary arterial pressure was normal, 31/11, mean 18 mmHg. Bronchoscopy showed an absent right upper bronchus with malacia and hypoplasia of the right middle and lower bronchi. She underwent two transcatheter coil embolisations of the aorto-pulmonary collateral (at age 6 and 24 months). Because of the left ventricular dysfunction treatment was commenced with an angiotensin-converting-enzyme (ACE) inhibitors and the patient remained symptom free. Left ventricular size and function had returned to normal by the age of 12 months. At 9 years follow-up left ventricular fractional shortening was 36% and end-diastolic dimension 41 mm (Z score + 1.08). The decision of the team was for conservative approach in view of the good clinical condition of the patient as well as the normalization of the ventricular function. The initial left ventricular dysfunction can be explained by the anomalous origin of circumflex coronary artery, and the improvement observed with the development of collateral coronary circulation over the years, as well as the effect of ACE inhibitors. The development of a fistulous communication between the anomalous right lower pulmonary vein and the right upper pulmonary vein draining to left atrium could be interpreted as an error which occurred during embryogenesis, when the splanchnic plexus connected to the lung buds is also related to the left atrium, that regresses lately. Otherwise it could be explained as a mechanism to bypass the subocclusion at the level of the inferior vena cava allowing the blood flow redirection to the left atrium. This male had an antenatal diagnosis of Scimitar syndrome at 15 weeks of gestational age. He was born at term and remained symptom-free at the first clinical evaluation. 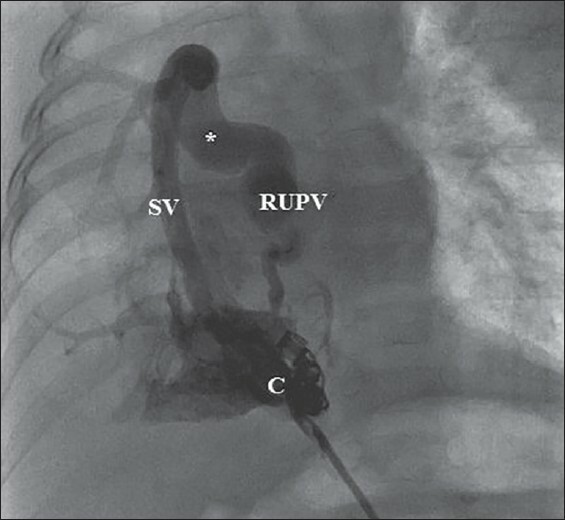 Postnatal assessment, including cardiac catheterization, confirmed the diagnosis of Scimitar variant with total anomalous right pulmonary venous drainage to the inferior vena cava below diaphragm, although there was severe obstruction of the anomalous vein at the junction with inferior vena cava; a collateral vessel was seen between the right pulmonary vein and artery through selective injection into the inferior vena cava [Figure 2]. Interestingly, this was initially detected on echocardiogram by retrograde flow seen in the hypoplastic right pulmonary artery. There was also right lung hypoplasia with the medium and lower lobe supplied by two aorto-pulmonary collaterals arising from the descending aorta, above the diaphragm and from coeliac axis [Figure 3]. Transcatheter coil embolization of the collaterals was performed at 3 months and 4 years of age. The patient remains in good condition with only mild wheezing. We report two cases of rare variants of the Scimitar syndrome in the same family. The presence of a Scimitar variant with absence of right pulmonary artery, associated with an anomalous origin of circumflex coronary artery from pulmonary trunk has not been reported so far. The presence of anastomotic connections between the Scimitar vein and left atrium has been described previously in classical form of Scimitar syndrome, although reported in about 10% of the population of a large series of patients;  we are unaware of previous descriptions of a fistulous communication between the Scimitar vein and right pulmonary artery, seen in patient 2. 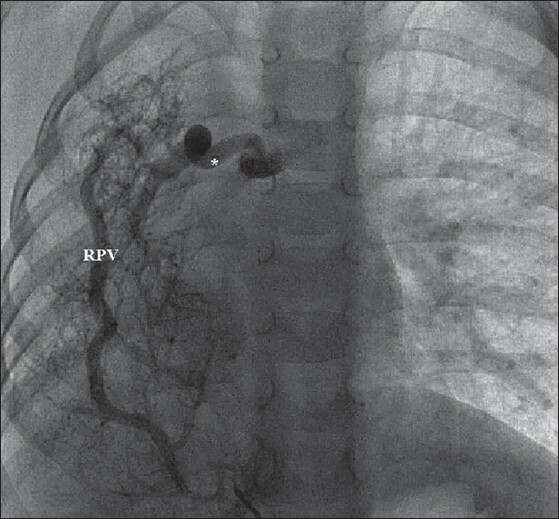 Despite severe stenosis of the right anomalous pulmonary vein at the junction with inferior vena cava, both patients remained well during follow up; this can be explained by the presence of the anastomosis of that venous system with the normally draining right upper pulmonary vein in case 1, that permits the physiologic drainage of arterial blood from the right lung to the left atrium. Furthermore the presence of severe lung hypoplasia together with right pulmonary artery hypoplasia or absence may account for the lack of symptoms of pulmonary hypertension. Ruggieri et al. described two siblings presenting with infantile form of Scimitar syndrome with partial right anomalous pulmonary venous drainage to the inferior vena cava, hypoplastic right pulmonary artery and lung, aorto-pulmonary collateral to the right lung and secundum atrial septal defect associated to craniofacial and central nervous system (CNS) anomalies. A genetic explanation for this occurrence has not been determined yet, but familial cases of Scimitar syndrome, despite extremely uncommon, could be the model for future investigations. In conclusion the Scimitar syndrome includes a spectrum of variants whose morphological characterization can be challenging. The identification of all the features may require a combination of complementary investigations. The pathophysiology of such lesions is still unclear, but one hypothesis speculates an embryogenic error in early development or a compensatory mechanism to the distal obstruction at the level of inferior vena cava. The therapeutic approach should be tailored for each individual case, and should also consider the clinical status, the complex anatomy and the treatment options. Goodman LR, Jamshidi A, Hipona FA. Meandering right pulmonary vein simulating the scimitar syndrome. Chest 1972;62:510-2. Misra M, Sadiq A, Rema Manohar KS, Neelakandhan KS. Scimitar syndrome with anomalous connection of left superior pulmonary vein to left innominate vein. Interact Cardiovasc Thorac Surg 2005;4:606-8. Rose C, Vosshenrich R. Incomplete Scimitar syndrome. Cardiol Young 2002;12:389-90. Al-Naami GH, Abu-Sulaiman R. A familial variant of the Scimitar syndrome with a meandering pulmonary vein. Cardiol Young 2006;16:308-9. Ashida K, Noruko T. Familial Scimitar syndrome. Three dimensional visualization of anomalous pulmonary vein in young sisters. Circulation 2001;103:E126-7. Ruggieri M, Abate M, Parano E, Distefano A, Guarnera S, Pavone L. Scimitar vein anomaly with multiple cardiac malformations, craniofacial, and central nervous system abnormalities in a brother and sister: Familial Scimitar anomaly or new syndrome?. Am J Genet Med 2003;116A:170-5. Trinca M, Rey C, Brevière GM, Vaksmann G, Francart C, Dupuis C. Familial Scimitar syndrome. Arch Mal Coeur Vaiss 1993;86:635-8. Dusenbery SM, Geva T, Seale A, Valente AM, Zhou J, Sena L, et al. Outcome predictors and implications for management of Scimitar syndrome. Am Heart J 2013;165:770-7. Abuhamad AZ, Bass T, Katz EM, Heyl PS. Familial recurrence of pulmonary sequestration. Obsetet Gynecol 1996;87:843-5. Freedom RM, Yoo SJ, Woo Goo H, Mikailian H, Anderson RH. The bronchopulmonary foregut malformation complex. Cardiol Young 2006;16:229-51.